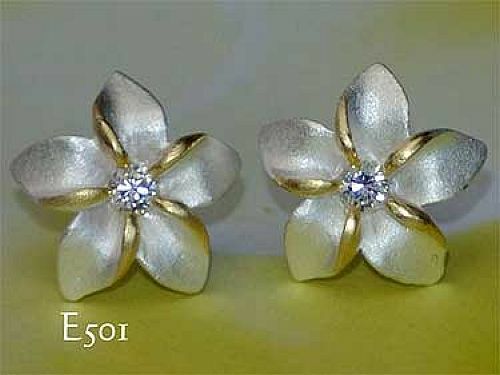 Sterling silver Hawaiian Plumeria (frangipani) stud earrings with frosted finish and features 14k gold plate highlights with a central sparkling clear cubic zirconia eye. Post back with spring butterfly clips. Matching pendant also available in our Hawaiian jewelry range. Measurements: Each flower is 8mm diameter. Weight per pair, 1.60 grams. Also available in sizes from 10mm to 15mm diameter.